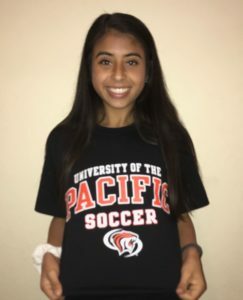 “I’m super happy to announce that I’ve verbally committed to play Division 1 soccer at the University of the Pacific! I’m ecstatic to be able to attend such a strong academic school with such an amazing soccer program. In this crazy ride, I have had many supporters along the way whom I can’t thank enough. I want to thank Henri Currie and Oscar Galvan who have pushed me to become a better athlete. I want to thank all my coaches along the way, Coach Tim Maestretti, Coach Antonio Sutton, Coach Aklesh Singh, Coach Ro, Coach Marek, and my current Placer DA Coach, Ron Benjamin, for pushing me and developing me to become the player I am today! Thank you to my friends and family who have endlessly rooted for me and supported me. I especially want to thank my mom for all the sacrifices and long drives. I wouldn’t be where I am today or the person I am today without her! She has taught me that the hard work, perseverance, love, sweat, and tears come with this wonderfully universal sport. These amazing people have made such a significant impact on my life, and no words can describe how much I appreciate them.